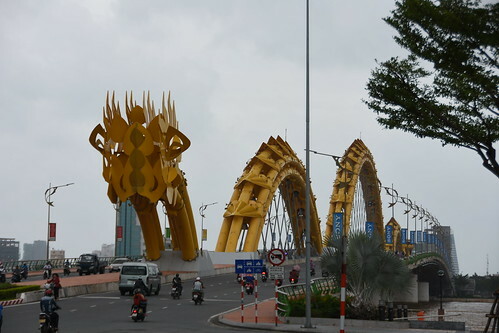 Architects love to play with shapes and the awesome fire breathing Dragon Bridge (Cầu Rồng) on Han Rive at Đà Nẵng, Vietnam is one such example. Designed by the US firm Louis Berger and Ammann & Whitney the hanging cable steel arch bridge is modelled to look like a giant dragon. The dragons are considered as one of the most important symbols in Vietnamese culture. It symbolizes power, nobility and good fortune. The 666 metre (2,185 ft.) long, 37.5 metre (123 feet) wide, 6-lane bridge opened on March 29, 2013. The dragon's head is 18.24 metre (60 ft.) long while its tail is 19.37 metre (63.5 ft.) long. The bridge is illuminated with thousands of colour changing LED lights. 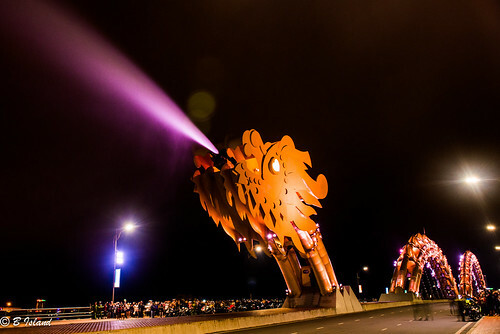 Every weekend (Saturday and Sunday) it draws thousands of locals and tourists to its fire and water-breathing show, when with a roar, the dragon's mouth belches a large plume of fire followed by hissing sound of spewing of water vapour/steam. Image from Flickr is by shankar s.